It was purely the idea of Herminie Cadolle to have something hold up a woman’s intricate chest region. To introduce her ingenious invention to the world, she brought her corset-gorge (a corset meant for the bust) to Paris Exposition Universelle in 1889. However as it is usual with many inventions, her corset was crude and not as appealing as its successors. To her disappointment, it never received the acclamation she had thought. It was not until 1893 when Marie Tucek came up with a breast supporter which closely resembles the modern bra. It was uncomfortable to wear but some daring women preferred it to the conventional corset. Consequently, Marie Tucek filed the first known bra patent during that year. 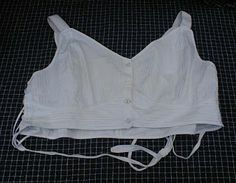 In 1914, a comfortable alternative dubbed “the handkerchief bra” was introduced by Mary Phelps Jacobs (Careese Crosby). Mary was a New York socialite and entrepreneur. It had no cups but became a hit in that decade. She sold the bras under the Caresse brand but later sold the patent and the company to Warner Corset. Many companies caught a whiff of her concept and started making knock-offs. As a result, the bra gained an astonishing popularity well into the aftermath of the First World War. In 1922, Ida Rosenthal incorporated the more comfortable cups in the bra and began selling them through her company, Maidenform. Her version is considered to identical to the modern bra complete with elastic bust cups and adjustable straps. In the 1930s, the attention moved from the comfort of the bra to how it could conform to young women’s curvier and more natural shape. S.H. Camp Maternity Wear Company introduced a seamless bra and the modern bra measurement size scheme. The bra underwent some minor modifications in the 1940s when more women began working in ammunition factories. Women’s lingerie, however, has remained the same in terms of design since then. The history of the bra has been quite a short but progressive story. They have not really evolved a lot since the first basic concept.